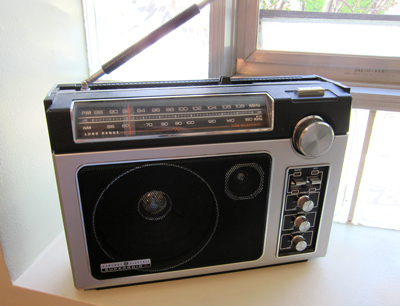 The General Electric Super Radio II (Model 7-2885F) is a classic AM/FM portable radio. A lot has been written in print and on the internet about this incredible performer. The unit was produced from about 1987 (it was preceded by the original, similar-looking Super Radio) until 1994, when it was replaced by the completely redesigned Superadio III. I bought this radio a week before my older daughter was born in 1992. It cost under $50 at Montgomery Ward. About a year later, I bought another SRII which had been modified for SCA reception (radio signals that ride "under" some regular FM stations' signals-- see this Wikipedia page for a description of SCA), but I sold it after I realized I didn't really use that feature all that much. Its reception beats all other radios in its class; despite my living near two AM powerhouse stations, there is very little bleed-over or "ghosting" on the dial. On FM, it can pull stations "out of the weeds" beautifully. For a while I had this radio in my office in downtown Chicago; it pulled in the stations-- even AM-- despite the fact that I was inside the Chicago Board of Trade Building, an iron- and steel- constructed building in the middle of the city. The Super Radio II is now my getting-ready-for-work radio, and it does a great job whether I am listening to talk or music. The audio rivals the Grundigs on this site, and its sensitivity and selectivity rarely let me down. Rather than go on glowingly about the radio, here is a link to Dave Moisan's excellent Super Radio FAQ. The FAQ covers other versions of the Super Radio series, and some of the differences between the models are pointed out. I will say this about the radio: there was no better AM/FM radio available in its class, and it truly is a stellar performer!